As I 've continued to scour through the 10+ hours of footage I shot last month in Groningen, Amsterdam and Zurich, I've been trying to find ways to get Streetfilms fans some video and posts about what I experienced. One thing that super impressed me was during my three days in Zurich I saw no cyclists crash while navigating the omnipresent surface rails for the 15 tram lines that run all over Zurich. I was told by some there are certainly problems and crashes happen, but I saw some real pro rail riding behavior. I ended up capturing just a little bit for your consumption in this shortie. 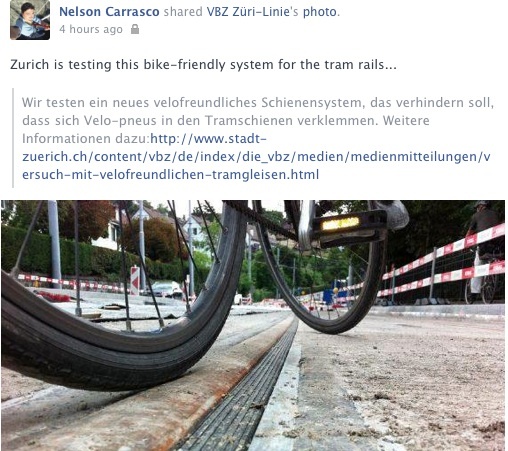 Alas, great news comes today from one of my Zurich interview subjects, Nelson Carrasco. The city is experimenting with rail treatments that will make bicycling on streets with rails much safer. Essentially, it seems they will be testing a material that is strong enough to support a bicycle but will yield to the weight when a tram runs over it. The English-translation of the above post is essentially: "We are testing a new bike-friendly rail system, which is intended to prevent bicycle tires getting jammed in the tram rail." For all those who really want to read the entire article (and in English) I ran it through a translator and will post the text at the bottom after the jump. Of course anytime I've travel to other rail-heavy cities, I'm mesmerized by how cyclists navigate rails, in particular because if the thought of crashing is terrifying for me as a very experienced cyclist, I can't imagine what it is like for a new-bee or someone transporting a child. Many years ago in Seattle I shot this impromptu footage of sharrows used to direct cyclists how to approach rails. San Francisco, Portland, Salt Lake City and plenty of other U.S. cities might want to take notice! And for anyone who wanted to read the text translation, here you go! "During the summer holidays in Zurich is the sword Arthur Cohn - gala station restored and refurbished for disabled people. Also the tracks will be replaced. The VBZ takes this opportunity to test a new rail system. This will prevent jamming of Velopneus in tracks. At a length of 90 meters, the construction. A Gummifullung is attached in the Schienenrille. Trams during the passage of the fill is pressed down, but not during the passage of bicycles. These are too easy. For the construction of the station the VBZ sword invest a total of around 2.7 million Swiss francs. The additional costs for the new rail system is 415' 000 Swiss francs. innovative Schienenkonstruktion is tested now, for the first time in public transport. The requirements are high. Also notes that cycling guests spend an average should increase the security for the new material and at the same time must be the burden of passing trams. Similarly, it must withstand weather conditions a wide variety: heat, cold, rain, snow or ice. In the winter, in addition to the load of road salt. The city of Zurich and the VBZ with this attempt at a contribution to increase the security for also notes that cycling guests spend an average, as in the municipal council since 2007 has consistently demanded. The attempt is a measure from the Velolabor implemented the master plan bike. The master plan of the city of Zurich bike is a central element of the program "Urban Transport 2025" and its objectives is used at different levels. The experiment should be successful, this does not automatically lead to a replacement of existing whish vegetables are organically grown. Much more would be provided for the installation at neuralgic points very often, where many also notes that cycling guests spend an average close to the track or drive this cross. This is as far as it needs to but even with a successful attempt for further development work. in Europe there are currently no product, which was successfully tested over a longer period. Also in the center of the city of Zurich were trials such as in route (ALBISRIEDEN-KLUSPLATZ )not successfully since 2007. So far there have been reinforced in the existing rails installed. These have quickly worn by the driving of the trams and had to be removed. The knowledge gained from these experiments could be the installation of a Gummifullers alone, that does not seem to work. For a new experiment had to be considered so the whole rail system. The Verdrangungsraum for the built-in filler material had to be large, to ensure they don't come back by the sharp wheel flanges cut. If the attempt is successful, the next few months will show. In spring 2014, the VBZ balance." Posted in Streetfilms News. Tagged as Bicycles, Bikes, cross tracks, light rail, rails, Switzerland, tram, Transit, Zurich. One of the most popular articles on my personal blog is about the rail filler material on the Cherry Avenue bridge in Chicago. It's a multi-modal bridge that carries light bicycle, pedestrian, and freight traffic. By light, I mean one train a week with a few cars. People from around the world contact me about the rail filler material and I have very little information. This is because it hasn't been tested, to my knowledge, in a transit system so I think Zurich is the first. North American cities await the results! The amazing thing about the little short I shot in Seattle above is that I nearly didn't post it. Thought maybe no one would care. That video has been watched over 10K times. Sometimes it is remarkable what a little bit of information can generate!! While in Switzerland, I noticed that a lot of bicycles had wider tires (and hub powered lights!) than what I am used to seeing here in the US. Wider tires are definitely safer than the thin 23 and 25s when you are negotiating with train tracks. Are you sure Zurich only has a 5-6% bike modal share, it seems more like 20-25% watching your film. Wow, this is something we used to struggle with in Philly, and as I've moved to Providence, RI, where a streetcar is being considered, I've heard little talk about this aspect of how rail affects bike commuters. I'm really interested in seeing some of these ideas, like safer rail design and sharrow guides, be used in Providence if we get the streetcar. No, these tracks have a gap. You can see it in the video. I was unclear. I meant similar treatment (right angle path) as the Seattle video; not the rubber filling material. I see in this post a certain amount of rail romance. Sure, maybe most bikers navigate these rails OK. But every now and then there's an accident and someone dies. Bikes and street rails don't mix. But if this new innovation in Zurich works, I hope it can save some lives. If you are using these films to judge you are not seeing the S-Bahn which is a hugely popular service with frequent double-decked service to all points within Zurich and the surrounding area. I guess you would also need to keep in mind that the mode share for bicycling in January is zero. Zurich was not always this nice. They've rapidly improved tram, suburban rail, and intercity rail and bicycling conditions in the last few decades. It proves you don't need decades of bitter incrementality in transport planning. Decent, but would be a problem if cars could turn right here... but then next section of this "facility" has door zone bike lane on significant slope, and I would guess a 35mph speed limit. Here in suburban Orange County we call that a "Fail". Actually do bikes and trams have separate signal cycles here? If not, this is a catastrophe with paint to make it "Safe (TM)". OK, I am not gonna hate on anything else today. 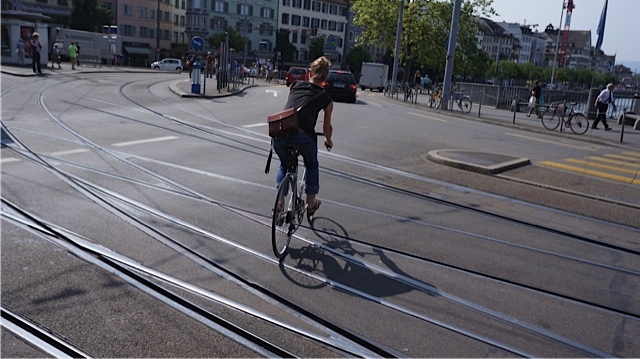 I used to ride a road bike along, over and in between street car tracks in Basel, Switzerland. For the most part they aren't too difficult to navigate, unless there's light snow, in which case they get really slick. If this stuff works at the very least it'd be one fewer thing to worry about while on 2 wheels. There are some track-gaps in San Francisco that are rubber-filled. Not enough, but some. The *zip* crossing seen in the 'shortie' is a dry weather maneuver; you probably need to be more deliberate when it's wet out as those rails get very slick. As a cyclist in Zurich I would say 5-6% is too much! veloSTRAIL was introduced in 2005 on Salzburger Lokalbahn. It is designed as a level crossing system for use with 113lb vignole section rails, and is not a filled flangeway system. On the Kattwyck Bridge in the Port of Hamburg a 2 crashes per month record for 2-wheelers was eradicated by installing veloSTRAIL in 2008 - but only at the ends of the bridge where the rails cross the road. The port bridge gets 70 freight trains and 3000 trucks crossing it daily and has no reported problems. The system has approvals for speeds between 120 and 160Km/h from several rail administrations. I've yet to see a flangeway filler system that works, and I've been looking into this since 1990 when I came across the OMNI (Goodyear) units in Seattle with rubber 'hose' glued in the flangeways on the waterfront streetcar line. The Zurich system used a special rail section and steel plates - again no current news, but possibly no longer on trial. VeloSTRAIL a level crossing system used with vignole section rails cures almost completely the problem of an open flangeway and has been working this way since 2005. I was involved in introducing the product to the UK. HOWEVER it is designed for use with the main standard section of rail used on standard rail lines (UK spec BR113/60A) The lighter 39E1 used for trams (matching the 41GPU grooved rail section) cannot currently take veloSTRAIL panels as the rail height is too small to accommodate the system. Worth noting that there are 5 basic mechanisms whereby rubber tyred vehicles can be adversely affected by embedded rails in the roadway, and understanding these you can plan to mitigate the loss of control events. It is also worth noting that for railway lines the flangeway gap needs to be around 60mm, but for trams (with a 'lighter' tyre flange and profile) the grooved rail slot is normally 35-42mm this aligns precisely with the 32-37mm tyre sizes most commonly found on road and utility bikes so a tyre can lock in the groove and relative rotation transfers from the wheel around the axle to the bike & rider going round the axle. 1 - The Darwin - the rider is riding parallel to the groove and rides directly in to it - often induced by parallel ridges in the abutting pavement where the embedding system joints are poorly finished. 4 - tyre contact patch sits on 2 edges of the groove and no other points with cyclist turning and placing a sideways force on the tyre with no resistance to sliding sideways (note how those 'flick' turns aim to cross the groove without a sideways force). An alert and experienced rider can recover if they act quickly to transfer weight and use the tyre still on a high friction surface to pull the bike clear. 5 - tyre contact patch sits on the groove at a shallow angle and the weight on that tyre (usually the front) delivers a turning moment against which there is minimal resistance. Tyre will turn and drop in to groove. This can be avoided/eliminated by making sure the forward velocity is high enough to override the turning forces and having a firm control of the handlebars. A key study - here https://bmcpublichealth.biomedcentral.com/articles/10.1186/s12889-016-3242-3 - based on riders in Toronto, where TTC fills the streets with tracks determined that a major factor in a rider falling was a sudden change in their planned route to cross the rails, through the actions of other road users. I've experienced this myself when a passing bus blocked a clean ride through and a number 5 event nearly put me on the road, but I recovered with a stamp down on the pedals. In the video just notice how there is almost always space to move cleanly as the cyclists plan to move across rails without having to also dodge tailgating cars and buses or car doors opening. Hi, quick question ; In Dublin a new light tram section has opened. Lot of issues for cyclist and rubber infills were raised as one solution. Are you saying that, once built ,such a solution is not possible on light tram with asphalt finish and grooved rails?or would require major rebuilding?